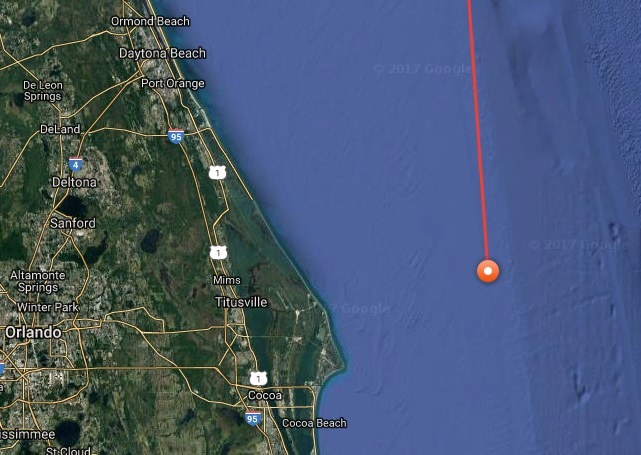 COCOA BEACH, Florida - A great white shark weighing over 450 pounds that was tagged with a radio transponder to be tracked by satellite has had its latest ping location off of Florida's Space Coast between Daytona Beach and Cocoa Beach on January 1, 2018. The 8-foot, 6-inch great white shark (Carcharodon carcharias), named Savannah, that was tagged off Hilton Head, South Carolina in March 2017, has quickly been making her way southward along Florida's coast. Savannah had remained just off the South Carolina coast as late as December 22, 2017, but then swam over 200 miles south to Florida's Space Coast in just ten days. The great white shark population has been growing along the U.S. East Coast, according to a study by NOAA Fisheries. The study also found that great white sharks occur primarily between Massachusetts and New Jersey during the summer, off Florida during winter, and with a broad distribution along the U.S. East Coast during spring and fall. Female great white sharks are believed to be mature when they are about 13-14 feet and can reach sizes up to about 21 feet in length. To follow the Savannah's latest location, visit the Ocearch tracking map.